Dental implants are a modern treatment solution for missing teeth, providing an effective alternative to dentures and dental bridges. Implants have grown in recent years to become a highly regarded, functional and long-lasting treatment. Though dental implants require the support of the jawbone to be implanted, they actually improve bone density once they are successfully implanted. This is because the implants replace both the tooth and its root, meaning that they are the most natural looking and functional option for missing teeth. 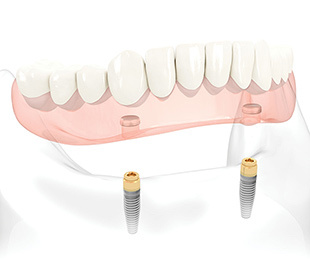 Implants can be used to replace a single tooth, several missing teeth or two arches of teeth. This is because they can be implemented in partnership with other dental treatments, such as crowns, bridges and dentures. They bring stability to the mouth and can last a lifetime if they are properly maintained. The first part of the treatment involves drilling a small hole into the jawbone and fitting the implants in place. During this stage you will be under local anaesthesia and free of any pain. Once the implant is securely in place it will be left to heal for around 3 to 4 months during a process known as osseointegration. Once the success of the implant’s integration with the jawbone has been established, an abutment will be attached to serve as a connecting device for a crown, bridge or denture. You will not need to worry about the tooth becoming loose, falling out or causing any damage to surrounding teeth or gums. Dental implants are an effective treatment solution and provide beneficial results in cases of missing teeth. They can also be used to stabilise dentures for improved comfort and stability. Do you suffer from loose dentures? Implant-supported dentures may be the solution that you need. The dentures are attached to dental implants, which gives them additional support, unlike regular dentures which are supported purely by the gums. Support is achieved via multiple attachments located on the denture, which allows it to be snapped on to the dental implants. Usually a minimum of 4 implants is required in the upper jaw and 2 in the lower jaw.